Juicy hamburgers with a tasty salsa sauce on the side. Heat a pan or skillet until you can barely hold your hand over it without having to pull it away. 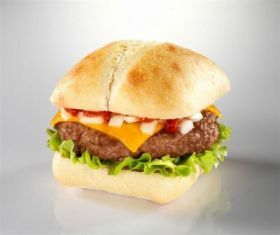 Add the burgers and cook, turning just once using the same cooking times above for barbecue grilling. There will be enough oil on the burgers to cook them. Toast the buns and pop in the burgers and top with tomato salsa (see below). Don't be tempted to turn the burgers too early as they need to get a coating to seal them, otherwise they will stick.